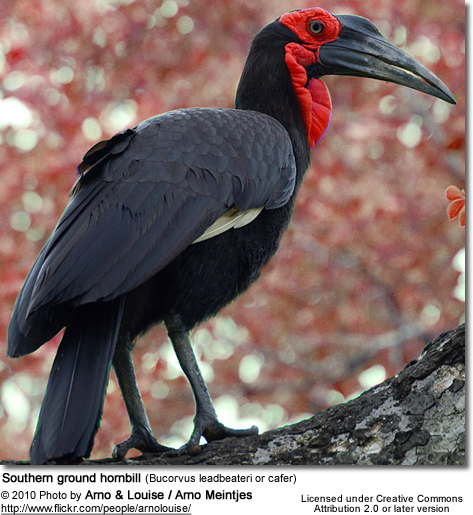 The Southern Ground-hornbill or cafer (Bucorvus leadbeateri) is one of two species of ground-hornbill and is the largest species of hornbill. 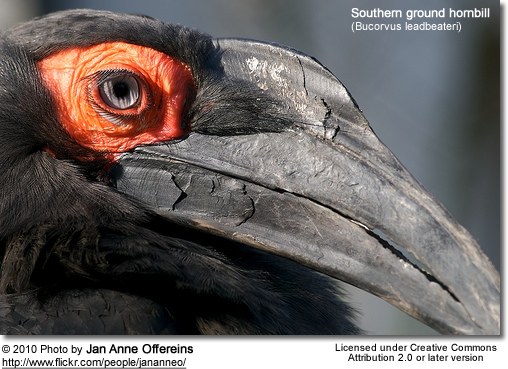 The other species of the genus Bucorvus is the Abyssinian Ground-hornbill, B. abyssinicus. It is a large bird, at 90 to 129 cm (36 to 51 in) long and a weight of 2.2 to 6.2 kg (4.8 to 13.6 lbs), with the male considerably larger than the female. It is characterized by black coloration and vivid red patches of bare skin on the face and throat (yellow in juvenile birds). The white tips of the wings (primary feathers) seen in flight are another diagnostic characteristic. 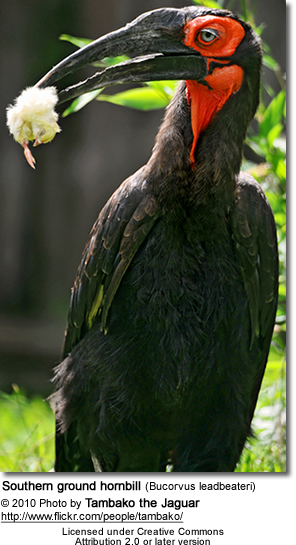 The beak is black and straight and presents a casque, more developed in males. 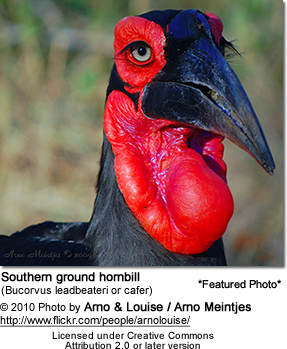 Female Southern Ground-hornbills are smaller and have violet-blue skin on their throats. The most prominent features of these large African-dwelling birds are their human-like eyes and the long, dark and curly "lashes." These aren't lashes at all. In facts birds don't have hair. The lashes consist of fine feathers - the function of which is to keep the dust out of the eyes. Juveniles are dependent on adults for 6 to 12 months. Its habitat comprises savannahs, woodlands and grasslands. 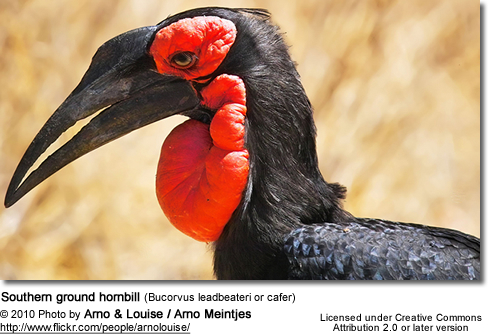 It can be found from northern Namibia and Angola to northern South Africa to Burundi and Kenya. 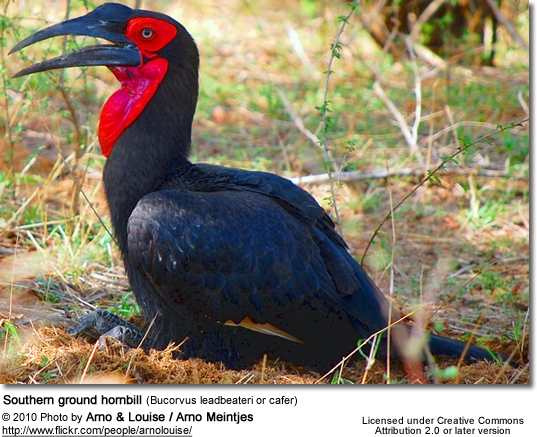 The Southern Ground Hornbill is a vulnerable species, mainly confined to national reserves and national parks. They live in groups of 5 to 10 individuals including adults and juveniles. Often, neighbouring groups are engaged in aerial pursuits. They forage on the ground, where they feed on reptiles, frogs, snails, insects and mammals up to the size of hares. Kemp, Alan (2003). 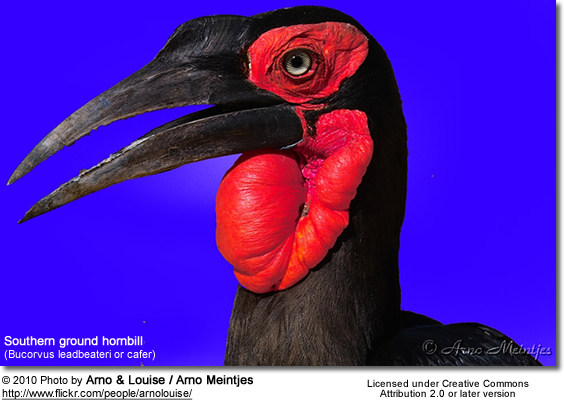 "Hornbills". in Christopher Perrins (Ed.). Firefly Encyclopedia of Birds. Firefly Books. pp. 384–389. ISBN 1-55297-777-3. Zimmerman, Dale A., Donald A. Turner, and David J. Pearson (1999). Birds of Kenya and Northern Tanzania. Princeton University Press. pp. 78–79, 397. ISBN 0-691-01022-6.